So you want to write songs? Awesome! Music is a powerful and accessible medium with the ability to reach audiences of all ages. Sometimes, though, it’s hard to know where to start. With the melody? The lyrics? The glittery outfit for the music video? The truth is that songwriting is just like any other form of writing. The only way it will happen is if you write. Here are a few guidelines to help you get started on the right track. Had a heartbreak recently? Write about it. Something in the political world got your feathers ruffled? Write about it. Love your cat? Write about it. Songs are an extremely versatile medium and anything goes as far as subject matter. Many newbie songwriters believe that, in order for a song to be good, it needs to be a deep soliloquy on matters of romance or internal conflict. And certainly many songs about these subjects have been great successes. However, one need look no further than the Toby Keith hit “Red Solo Cup” to know that even the little things can make successful songs. You don’t need to be a musician in order to be a songwriter. Many songwriters stick to lyrics only, and collaborate with musicians to come up with a melody and chord progression that works. Certainly having some musical training helps, but it’s not necessary. If being involved in the musical aspect of songwriting is important to you, try taking piano lessons, or getting books on music theory, or asking a musician friend to sit down with you and go over some basics. The main musical idea lyricists tend to struggle with is meter, or how many beats go in a measure. One line of lyrics is generally about 1-2 measures long, so it needs to be pretty concise. Tap a beat on your leg or desk if it helps. A line like, “Since you’ve been gone, it feels like there’s been a layer of ice all over my heart” may be a little clunky, but “Since you’ve been gone, my heart’s turned to ice” flows more smoothly and creates a stronger image. Some great lyrics have crashed and burned because a songwriter felt they had to make a perfect rhyme. “Your smile was like a shining star” is an evocative image, but if you rhyme it with “When I met you in that bar,” it’s going to create a certain tone for your listeners that you may or may not have intended (i.e., that particular rhyme would be great for a country song, but don’t try it in a sensitive love ballad). Ask yourself: “What kind of feelings do I want my listeners to have? Is there another word that evokes that feeling, even if it doesn’t rhyme?” In some cases, choosing not to rhyme can make a lyric more powerful. You poets out there are well aware of this already. That being said, if you haven’t studied or written poetry before, check out some books and learn about the different kinds of rhyme, such as imperfect rhyme, internal rhyme, and other rhyme schemes. On that note, songs are NOT poetry set to music. Not always. What makes an amazing poem will not necessarily make an amazing song. This doesn’t mean, though, that you can’t learn from poetry, or that you can’t start with a poem and turn it into a song. Just be aware that they have different forms and presentation methods. Challenge Yourself and Have Fun! You don’t need me to tell you this—writing can be SCARY. The good thing about songs, as opposed to, say, novels, is that they’re fairly short and you don’t need as much detail to tell a story. So have fun with it! Try experimenting with different genres, voices, POVs, and subject matter. Work with other songwriters. A great place to start (or continue!) is February Album Writing Month (FAWM), an online challenge to write 14 songs in 28 days. It’s like National Novel Writing Month (NaNoWriMo) for songwriters! You can post your work and get feedback, connect with other songwriters all over the world, and participate in challenges. It’s a close-knit and supportive community, and its members are of varying experience and musical ability. There are plenty of lyrics-only writers as well as musicians, and collaboration is highly encouraged. You can sign up at FAWM.org. It’s free, and I promise you’ll make some great friends in the process. And who knows? Perhaps one of those 14 songs of yours will go on to be a hit. Happy writing, and I hope to see you around FAWM! 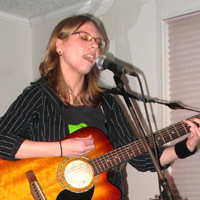 Robyn Mackenzie is a musician and writer from Edgewood, New Mexico. She recently graduated from the University of New Mexico with a self-designed Bachelor’s degree in the Arts and Education. She is a yearly participant in February Album Writing Month, an online challenge to write 14 songs in 28 days, and a similar challenge called 50/90. As well as songwriting, Robyn enjoys writing fiction and cheesy graphic novels. Her debut album, “Of Dreams and Dust,” was released in September 2010. You can find her on Facebook and Fawm.org. This article was originally published in the February 2012 issue of SouthWest Sage and is reprinted here by permission of the author.